When travelling with a pet in the car it is vital to consider its safety and comfort during the journey. A pet needs it own space in the car during a journey. To be squeezed between passengers can not only be uncomfortable for all concerned but the pet can become distressed, upset and experience sickness or loose bowels. If a pet is to travel on a seat ensure that it is covered with a blanket or waterproof covering. It is possible to purchase car seat covers that protect the car seats and keep them clean. If seats become covered in pet hair use sticky tape wound around the hand to remove the hairs. Unscented wet wipes are also a boon in a car as they can clean any surface and also be used by the passengers to freshen up. If the driver has to break suddenly any passenger in the car not wearing a seat belt will become a moveable missile and will not only be hurt themselves but can injure, even kill, other passengers - this includes pets. By installing a cage for the pet and tethering it to the car so it cannot move around the pet will feel comfortable in his own space and will remain safe in an accident. If you do not have room for a cage larger pets can be fitted with harnesses that clip onto the seat belt fitting on the back seat. Never let a pet travel on the front seat of the car. 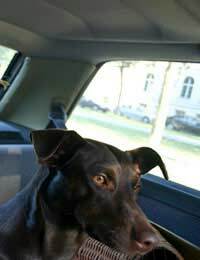 Although a flow of fresh air is always welcome in a car it could cause a draft for the pet sitting in the back of the car. Open windows can also mean that a pet can escape or someone could lean in and steal your beloved family pet. By all means have food and water ready for the pet for a break in the journey but it is advisable not to travel with food in his cage or on the seat. Not only will it make a mess but the food could trigger the need to urinate, or worse, and you may not be able to stop the car and find a place for him to ‘do his business.’ If the pet is prone to car sickness do not feed him for at least three hours before the journey. Not only is it against the law for dogs not to have a name tag on their collar whilst out in public but for the safety of all pets they should be micro chipped with up to date information as well. Never leave a pet along in a car. Even on a mild day the sun can make the car a very hot place and a pet can suffer, even die, very quickly. If you cannot take the pet with you when you leave the car perhaps it would be better to leave it at home. Cars are a great boon to pet owners as they can be transported to vets, for holidays and to places for exercise. But thought must be made before the car is a safe place for a pet.